At the beginning of the month of July of this year, reports began to emanate from Iran of vicious mobs assaulting Afghan workers and working families, particularly in the city of Yazd, where at least 200 homes of Afghan workers have been burnt down in a convulsion of racist violence. At least one Afghan refugee has been killed in the attacks, and there are unconfirmed reports of heinous brutalities being perpetrated against women, men and children of Afghan descent. It has been reported that armed basijis were escorting the lynch mobs in Yazd. Whether the armed basijis were accompanying the lynch mobs or not does not change the documented fact that the Islamic regime is officially behind the rise of such lynch mobs and anti-Afghan sentiments. Racial discrimination against Afghan workers in Iran has always been a policy of the Islamic regime, but its manifestations have recently become more flagrant and brazen. “Afaagheneh” (2), who have gradually over the past 34 or 35 years formed the lowest and most vulnerable layer of the Iranian proletariat, 3 million of them living in unbearable conditions and semi-slavery, have recently been prohibited from entering public parks, banned from recreational regions of the Caspian Sea, and arrested in some regions of Iran only to be forcibly and violently “deported” to other regions inside Iran. This month in Fars Province, the director general of immigration made vigilantism state policy, declaring that any citizen has the right to stop an “Afghan-looking” person in the street and demand to see identification and residence papers (ref). He has also ordered the closure of food shops that sell to “illegal Afghans,” and directed hospitals to refuse care to Afghan people. In the same racist spirit, medical facilities in Yazd have shamelessly refused to treat Afghan victims of the racist rampage in that city. This fascist policy and practice has been grounded in the rhetoric of genocidaires: Illegal Afghans, they say, are “health hazards” against which citizens must be protected; citizens must be warned, they say, against the danger of “contamination” in buses and other public places if exposed to “illegal immigrants”! Recent outbursts of official fascism and racist policies and directives against Afghans are hardly lightning in a blue sky. For at least 33 years, Iranian capitalism has had access to an exceptionally cheap, conveniently disorganized, and legally extremely marginalized workforce. The barbaric exploitation of the Afghan work force would have not been as simple, and isolating the “Afghan” proletariat from the rest of the Iranian working class as manageable, if not for Iranian capitalism and its Islamic government’s investments in advocating racism and racial prejudice. Anti-Afghan sentiment and overt racism against Afghans have long constituted a subculture of the most backwards portion of Iranian population. This prejudice existed before the Islamic regime and will continue to exist after the Islamic regime unless the problem is addressed in its entirety, on all levels and fronts. Iran is not the only country in the world to witness the rise of racism as result of the current global economical and political crisis. 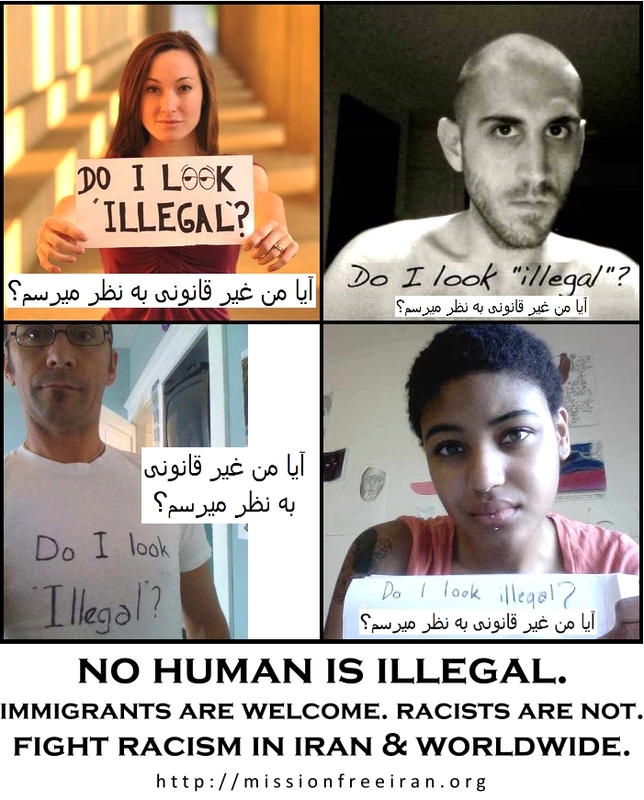 Indeed, the state of Arizona in the US recently passed legislation that allows police to demand the identification papers of anyone who “looks illegal,” which effectively legalizes racism and signals a reactionary descent into apartheid-era social relations. Greece, Cyprus, Pakistan, Sweden, Denmark, Russia, Israel …are all witnessing a boom in racism and fascism as reaction to both the incompetence of the normal representatives of the capitalist system, and to an emerging new left, the threat of revolution, and the global movement of the 99%. The Islamic regime is not the only political entity which – in times of increasingly unmanageable economical and political crises, vast poverty, and deepening recession and unemployment – attempts to create an illegitimate “safety valve” to even temporarily release growing societal pressure by directly and openly attacking the weakest link in the working class of Iran. And there is no doubt that after Afghans, a new round of offensives against the rest of society – against women’s rights and workers’ living standards – will follow. Our society is not the only one in which hate and racism influence and motivate the lowest layers of the population, the Islamic regime’s primary element, the lumpen proletariat and lower factions of the Iranian petit bourgeoisie. On the down side, the progressive forces in the Iranian political arena, unlike the progressive forces in the West, do not recognize racism in Iran as a social phenomenon. They are blind to the fact that racism is a social force which, given a chance and especially in Iran, could become a serious obstacle in front of the impending revolution to overthrow the Islamic regime, with potentially devastating impacts on the form and content of post-Islamic regime governance. The refusal to confront widespread anti-Afghan racism disarms progressive forces from addressing racism in its entirety, on all fronts. But there is an upside which makes our fight against racism rather unique: the foundations from which we launch our offensive against racism are the grassroots activist networks in the vanguard of the class struggle – labor activists. This is due to the fact that the utter rightslessness of Afghan refugees is not only an ethical concern for Iranian workers, but also a matter of political and economic self-interest: full equality and rights for Afghan workers will neutralize the capital owners’ and the anti-labor Islamic government’s upper hand in taking advantage of an “army” of semi-enslaved workers. This then will lead to an increase in wages and living standards of Afghans as well as the working class in general. Equal rights will change the balance of political power in favor of the working class. Equal rights for both “immigrant” workers and for women will certainly move the frontiers in favor of working people. Equality and full rights for whoever lives and works on Iranian soil has long been more of a principled statement than a pressing demand around which progressive workers in Iran mobilize the rank and file and aim to achieve it. However, these recent events compel us to brand equal rights as our standard, a demand around which 3 million Afghan workers and their families – partners, children and the elderly – should join hands with their Iranian-born sisters and brothers and not only defeat racism and fascism, but pave the way for greater victories for humanity in Iran and the region. We unequivocally condemn these racist attacks against our Afghan sisters and brothers – attacks that are supported explicitly by the Islamic regime in Iran, and implicitly by UNHCR through its condemnable silence (3). We support the May 1st workers’ demands for equal rights and fairness (4), even in a place like Iran where under the current regime no one has even the most basic of human rights. We declare our solidarity with Afghan refugees in Iran, and call on all honorable people inside and outside of Iran to do the same. Long live solidarity of humankind! Down with the Islamic regime of apartheid and racism! 2) Afaagheneh is a term used by the Islamic regime, with humiliating intonation, to refer to Afghan refugees. 3) UNHCR, the United Nations Refugee Agency, bears a key responsibility towards Afghan people in Iran, the vast majority of whom are refugees, or have been born into statelessness due to the refugee status of their parents and the racist policies of the Iranian state. Yet UNHCR has not condemned the recent attacks against Afghan refugees in Iran. 4) Iranian unions have demanded job security for workers and all wage earners; the end of all discriminatory laws against women and insuring full and unconditional equality of women and men in all aspects of social, economic, political, cultural, and family affairs; putting an end to all discriminatory payment practices, and allowing everyone to benefit from social and medical services; and they have demanded that all children, irrespective of their parents’ economic and social status, gender, nationality, race, and religion, must be granted free and equal educational, welfare, and health care benefits. (see: 10 Minimum Demands of Iranian Workers, issued in recognition of May 1, 2010 and signed by the Tehran and Municipality Bus Workers Syndicate, the Haft Tapeh Sugar Refinery Workers Syndicate, the Free Assembly of Iranian Workers, and the Kermanshah Electrical and Metal Workers Guild: https://missionfreeiran.org/2010/04/22/in-anticipation-of-may-1-workers%e2%80%99-minimal-demands). « …و آنها ابتدا به سراغ افغانها آمدند.